Hey everyone! Welcome to the latest episode of Teen Jazz Radio! I’m Shannon Kennedy, your host and I’d like to thank you for taking the time out of your day to listen to our show and to the fantastic young artists we feature as part of each podcast. Today on Teen Jazz Radio I’m going to discuss a few skills or qualities you should focus on developing if you are hoping to pursue a career in music. Of course, these things are beneficial across a wide variety of vocations, but I’m going to focus on how they can help you specifically as an artist or musician. In this episode, I’m also going to feature the music of Bastian Weinhold, Adam Larson, Reggie Padilla, Yvonnick Prené, Tim Owens and Poor Man’s Fortune. So, before we dive into today’s tips, let’s check out our first music set. This week I’d like to introduce you to Bastian Weinhold and Adam Larson. The first song you’ll hear is The Snowman by Bastian Weinhold from his newly released album Cityscape and second I’m going to feature Simple Beauty by Adam Larson from Simple Beauty . Once again, that was Adam Larson with Simple Beauty and before that was Bastian Weinhold with The Snowman. You can find more information about Adam at adamlarsonjazz.com and Bastian at bastianweinhold.com. Alright, so important qualities, skills and/or traits to have as a musician. There may be quite a few things that come to mind, but I’m going to talk about 13 in specific. If you feel I’ve left anything out or if you would like to expand upon one of the thirteen I’m going to talk about today, I’d like to invite you to Teen Jazz to join the discussion. That’s TeenJazz.com. I’ll have a transcription of today’s emission up on the website and comments are more than welcome, so I look forward to hearing from you. In music, like any art (or business for that matter), you need to be able to think outside the box (yes, I know that’s a tired and overused phrase, but it’s used too often for a reason). As an artist, you should have a desire to create something unique, to contribute to your genre and not just be another voice that gets lost in the crowd. There’s no room to continue doing what’s already been done because, well, it’s already been done. The only true way to succeed for any length of time is to forge your own path. Yes, it may work to continue in the footsteps of another artist, but for how long? And do you really want to be compared to them for the duration of your career? You risk being known as a “bad copy” of so and so artist rather than an artist in your own right. I don’t know about you, but I’d rather take the risk of trying something new and standing on my own than live in someone else’s shadow. So, to be innovative, to be original and creative in thinking or to create a product or idea that is new. Yes, it may be hard, but it isn’t impossible. What can you do that no one else is doing? What can you bring to the table that’s different and uniquely you? No two people are the same. We all have our own backgrounds, our own history, our own unique music preferences. Find a way to bring all that together to create your own voice and contribute to the music industry by bringing something new and innovative to the table. Okay, so I’m not really doing these in any particular order, so let’s pick the next one. We live in a digital world and technology is the primary vehicle for how more and more music is created, documented, distributed and promoted. Heck, even concerts are now broadcast online for those who can not physically make it out to concerts. Arguably, of course, music was always created using some facet of technology or another, but the two, in my opinion, are becoming more and more intertwined. For example, a number of young artists such as Madeon take full advantage of the technology available to them to create dance music while marketing has shifted from posters, direct mailings, and catalogs to a strong focus on online stores, social media, and online advertising. All of that to say that you should do what you can to take advantage of all the technology available to you. Don’t think of it as an obstacle. Do what you need to do to learn how to use the tools that are available to you whether it’s for creating music or promoting it, don’t shy away from it (unless, of course, that’s a part of your brand and you’ve found another way to succeed without it). Because of technology, marketing, promotion, and even recording are easier and more accessible than ever. AND because of technology, it’s easier to learn how to do those things too (Youtube tutorials, online classes, Skype, easier access to authorities on all of this stuff, etc). You can build a basic home studio, record an album with musicians from anywhere in the world, and even distribute your own music. Before this wasn’t possible, and to record an album, musicians often had to reserve expensive studio spaces and actually fly musicians in to create it. Now we can invest all the time in the world into our albums because we’re not trying to rush through the recording process and keep costs down and we can collaborate with a wider range of musicians more affordably thanks to technology. And it’s not just recording that’s gotten easier and more affordable. Learning music has also improved. You can take lessons from other musicians anywhere in the world via Skype, Google hangouts, etc. Of course, one can argue that you lose something taking lessons with someone online rather than in person, and I’d probably say you’re right, but at the same time, if you can study with someone you couldn’t before, wouldn’t you say that’s a win? On the marketing side of things, technology has created marketing and promotion opportunities for independent musicians that weren’t affordable or accessible in the past. Now, you can implement a full-on Web 3.0 campaign using tools such as Facebook, Twitter, Soundcloud, Youtube, Sonicbids, online radio stations, podcasts, blogs, etc. and it’s all reasonably affordable. Of course, the bigger budget you have, the farther you could arguably reach, but there are people out there doing just fine without a big budget, so I’d spend some time thinking about how you can do it too. 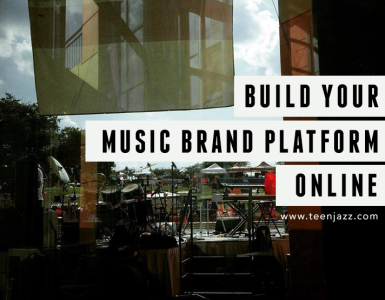 There are tools to distribute your music such as CDBaby and Tunecore, ways to promote it both freely and with advertising dollars, and it’s so easy to make your music available to your audience. To succeed in music, you need to be willing to show initiative and be aggressive (within reason). You have do things for yourself because no one else will do it for you. It’s a lot of work, but it’s part of your job description. You are the only one who’s going to make it happen for you, so if you aren’t out there networking, doing the work and research, then you’re only hurting yourself. Take responsibility for your career and your music and step into the leadership position required. No one will want to help you do things if they don’t see that you’re making the effort to do them first. An example of this is the 180 shift a lot of record labels have made in the last few years. In the past, labels would often seek out undiscovered talent and then spend their time creating an artist and building an audience for them, but more and more, labels are picking up artists who have already built their audiences on their own because it makes their job a bit easier. These artists are leaders and they made it their responsibility to make their career happen and in the end, you could say it paid off for them. Of course, there are always exceptions, especially in the above case, but that doesn’t mean you shouldn’t take initiative and make things happen for yourself first. This one isn’t really a trait, it’s more of a skill, but it is something you should at least be aware of running your own music business. Because of the Internet, we now have a global audience and that’s important to keep in mind when sending out messages or promoting your music. There is cross-cultural communication taking place on a daily basis, and so, we now not only need to be aware of our own culture’s ethics and customs, but begin to develop a broader understanding of those of our neighbors. I’m not saying that you need to have a full understanding of all the history and cultures of the world, but if you become active or begin to communicate with certain markets, a basic understanding or an effort to find common ground can go a long way to you becoming successful in that market. Musicians also have the opportunity to travel the world, so do your work in advance. Find out what the visa requirements are before you go on a trip. Do you need vaccinations? What are some basic phrases in the language of the country you’ll be visiting? It’s good manners to at least make a small effort to learn some of the language of the places you visit rather than expecting everyone else to speak your language. Little things like that can make a big difference both in how much you enjoy your trip and how your audience receives you as an artist. As a musician you are self employed and you run your own business, so you need to operate accordingly. Make sure that you do everything in an ethical manner. Treat your band members fairly and be honest. Do all of your paperwork business properly (copyrights, pay the royalties you need to pay, people what they deserve to be paid). Show up to your gigs on time, do your homework (learn the music and practice and so on). Have checks for the musicians at the gig, don’t make them chase you down to get paid (that’s not cool). Don’t promote yourself on someone else’s gig unless you’ve discussed it with them first (or they may not call you back). Of course, there are plenty of other examples. Music is all about networking and relationships – do everything you can to earn a good reputation and foster strong, healthy relationships with those around you. Trust is necessary to build partner and audience loyalty. Plus, there are laws there to punish you for doing the paper side of your business wrong! Don’t end up a part of a lawsuit because you didn’t secure the rights to use a sample or record a cover of someone else’s song. Make sure you sign contracts with fellow composers when you write together or with band members when you form a group. Get contracts for your gigs and make sure you do what is required of you. Don’t be flaky. If you tell someone you’re going to call them or email them, do it. Regardless of if it’s a fan, band member or promoter, if you say you’re going to do something, just do it! If you need to, take notes, set reminders, or do it right away so you don’t forget. Not everyone is good at doing this, and so if you do, you will stand out. Now let’s check out the next set of music featuring Reggie Padilla and Yvonnick Prené. The first song you’ll hear is Don’t Forget to Smile by Reggie Padilla from the album They Come and They Go and second I’m going to feature Never Let Me Go by Yvonnick Prené from Jour de Fête . Once again, that was Yvonnick Prene with Never Let Me Go and before that was Reggie Padilla with Don’t Forget to Smile. You can find more information about Reggie at reggiepadilla.com and Yvonnick Prene is at yvonnickprene.com. One of the best skills you can have as an artist is that of adaptability or versatility. You need to be able to not only adapt your playing, but you also need to adapt to different situations, different crowd sizes, different venues, etc. Adapt your style and set list based on the audience at your shows or even the musicians playing with you that night. Pay attention to what they react to and what they don’t and respond accordingly. Be willing to play other musics, consider doubling and do what you can to remain versatile as a musician. You’re willingness to do this may create opportunities for you that you otherwise would not have had. Until you’re established as an artist, music also requires you to be adaptable because you have to be able to perform a wide range of music. One night you may be playing straight ahead jazz with your trio at a restaurant and the next be on stage with a pop star, backing them up. 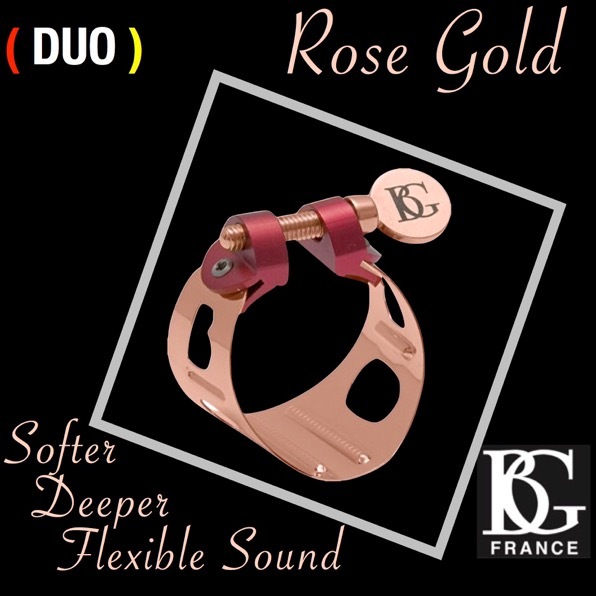 You need to be able to adapt to those different styles both musically and with your setup. If you plan on doing a wide range of music, make sure you’re equipped in every sense to do so. Succeeding in music can be hard, so you have to be determined and willing to persevere. You also need to be able to overcome objections. If someone tells you no, pick yourself up and keep going. Keep in mind that sometimes the “no” may have nothing to do with you. They might have said “no” to ten others before you and the response became automatic. Maybe it was just “no” to the particular thing you were asking and there’s another angle you can try. Or maybe the opportunity isn’t right and you need to look elsewhere. There are also ways to turn “no” into “yes.” Try asking the question a different way or asking for something else entirely. Instead, try asking when they book their events so you can call at a different time, or if they know of other opportunities that may be more appropriate or about another opportunity they may be tied to, one you weren’t initially inquiring about. Be sociable. If you can, I’d even suggest taking a speech class. You are on stage in front of people and you need to be able effectively communicate both on and off stage. You should be comfortable around all sorts of people and know how to positively react in all types of situations. Of course, there are always surprises, but the more prepared you are and the more practice you have, the better you’ll do when they pop up. You also will need to interact with all sorts of people – fans, booking agents, promoters, managers and you need to know how to act accordingly. Each relationship has its own dynamic and you’ll need to know how to approach and interact with different kinds of people in different kinds of roles. Another communication skill that you need to be equipped with is that of closing or negotiating. Yes, they are two different things, but they’re often tied together. When you’re negotiating your pay or time or travel per diems for a gig, you need to know what you’re doing otherwise you’ll end up with the short end of the stick (or no gig at all). You also need to know how to close your negotiations so that the other person doesn’t feel like they ended up with the short end either. It’s not easy, but if you want an opportunity to be more than a one time thing, it’s a good skill to have. Be well organized. You can operate more efficiently and effectively if your business and workspace are properly organized (and clean). When I have a messy desk, I have a hard time working because it’s overwhelming to work around. For me, being organized is key to my success. I feel more productive and I’m able to work with better focus when I’m organized. If I keep my practice organized, I also have more successful practice sessions. So, I also suggest having a distraction-free practice/songwriting space. I have a specific area where I practice away from my computer so that I am not distracted by calls or texts or the temptation of checking Facebook. I have my sax, my stand, my music, headphones and my phone on airplane mode so that I can focus on the task at hand. Organizing your time is also imperative. Create a practice schedule and create goals so you can measure your improvement and growth. 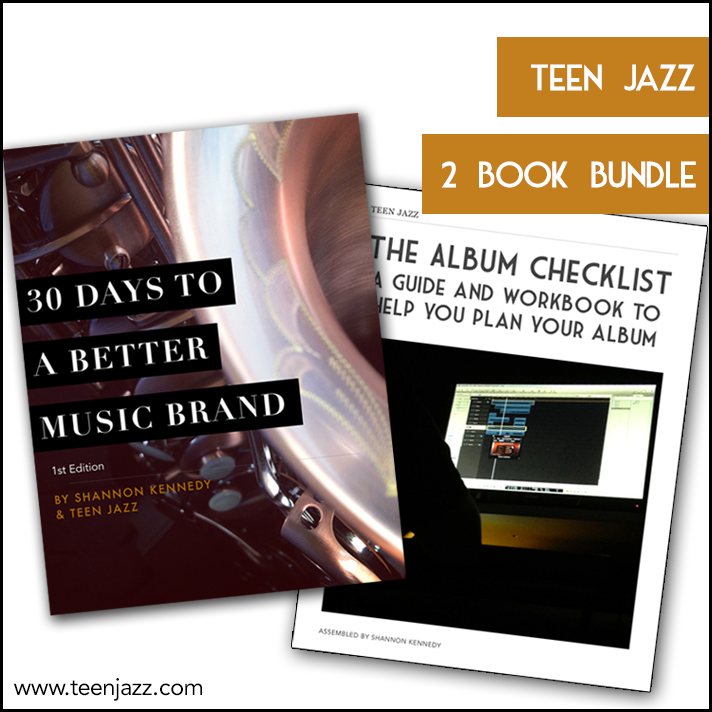 We have a few practice journal templates and a Project 365 sheet available on Teen Jazz if you’re looking for something to help keep yourself organized. I’m going to keep this one short, because like I just mentioned as part of organization, planning is important. Riding by the seat of your pants is never a good business or practice plan, and your music is a business so make goals and set deadlines. For example, if you sit down to practice without any goals in mind, what do you end up doing? You end up working through whatever you feel like but it might not be what you need to work on. Keep that in mind. 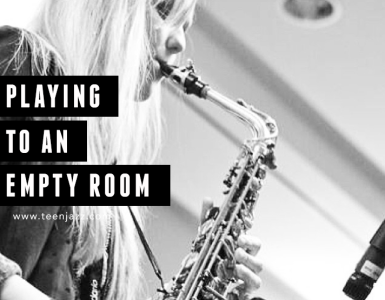 I’ve always found that when I practice something specific, something I need to work on, my practice sessions are far more productive when I practice just for the sake of practicing and putting time in on my instrument. Go at it with a plan in mind. This is why a practice journal is great because you can note things you want to work on so that you always have something to work towards when you practice. Another reason planning is important is that as a creative type, we can often do and redo things without ever finishing them because we want them to be amazing. You need to know when to let a project go and decide when to stop. Deadlines can help with this. When you’re self-employed its easy to let time pass you by while you complete projects. Once you’ve decided to do an album or project, set deadlines and goals to help keep you on track. That way you don’t spend too much time working on something and you work a bit harder to get it where you want it faster than you would without a deadline. Continued growth is so important as an artist. If you keep doing the same thing, you’re audience is going to get bored (and you will too). It might even lead to you quitting because of frustration or boredom. This is why it’s so imperative to always look for ways to grow and improve and continue to learn. A lack of drive, motivation or focus will prevent you from releasing new material and it will also prevent you from growing as a musician and artist. An inability or refusal to learn or grow will result in your music becoming “outdated” and loss of appeal to your audience. Of course, this can be a struggle. There are times where we get frustrated with our playing or feel as though we’re not making any progress. These plateaus can be hard to break past, but it isn’t impossible. Sometimes you just need to get a bit creative to work through them. For example, studying with a teacher could help. He or she might be able to pinpoint what’s preventing you from progressing or suggest a new way to go at your practice sessions that you haven’t tried before. These little changes can make all the difference in the world. If you’d like a few more tips on how to push through a plateau, we’ll include a link at teenjazz.com along with the transcription of this week’s episode. Or you can work on something completely different. Listen to different music than you normally would, play along, work on an etude for another instrument or begin to study another instrument just to give you a new perspective on your own. And it isn’t just your playing that you should work on. 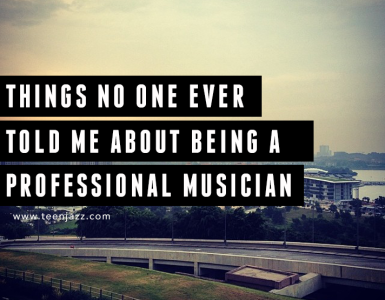 It’s also your overall performance – your show, your stage presence, etc. How fluidly do you move between songs when you’re performing? Do you have segues or medleys worked out? Are you comfortable talking on the mic? What do you look like on stage? Have you been playing the same set of songs for a few weeks or months? Constantly reinvigorate your show with new songs, etc. (especially for fans that come to several of your shows, they might grow tired of hearing the same jokes and songs). These are all things to think about and improve. Always make sure that you’re working on your craft, learning or improving new techniques, building up your repertoire, and expanding your catalog. Read as many books and listen to as much music as you can and absorb as much of it as possible. Most of all, have a good attitude. Share your excitement and passion. People are less likely to want to work with you if you have a bad attitude, big ego or spend your time complaining even if you’re incredibly talented. A successful live performance requires a good energy and if you’re not contributing to that, or even taking away from it, you make the other musicians’ jobs that much harder. Don’t be that person. Music is hard, but it’s important to avoid becoming bitter. It’s a career path that you’ve chosen to pursue, so remember that. When things are hard, take things in stride and don’t let it get to you. It’s okay to be frustrated or upset every once in a while, but if you let it affect your overall feelings towards your job and how you perform or interact with other musicians, you aren’t going to get any where you want to go. Plus, the audience can often feel that kind of energy. Even if you smile on stage and pretend to have a good time, they’ll see it as inauthentic and will have a harder time connecting with you. That’s just something you should be aware of. So there you have it. Are there any skills you think we’ve missed that you’d like to add? Our last set of music for today’s show is going to feature Tim Owens and Poor Man’s Fortune. The first song you’ll hear is Realife by Tim Owens from the album The Realife Project and second I’m going to feature something a little different. A while back I talked about Breton music and I’d like to feature a group that plays that sort of music so you could hear it, this is Mardi Gras by Poor Man’s Fortune from Bayou Curious , a Breton group located in the US. Once again, that was Poor Man’s Fortune with Mardi Gras and before that was Tim Owens with Realife. You can find more information about Tim Owens at tiomusic.us and Poor Man’s Fortune is at poormansfortune.com/music. A very special thanks to Jazz and Bossa Radio for featuring Teen Jazz Radio on their web radio station. We recently partnered with them at the beginning of this month to share our artists with a wider audience and we are excited to have joined the Jazz and Bossa Radio family. You can visit them at jazzandbossaradio.com. All of our Teen Jazz Radio podcasts are featured over at Jazz and Bossa Radio on Sundays at 3pm EST and on Wednesdays at 5pm EST.